Woman Seated in a Loge (1881). 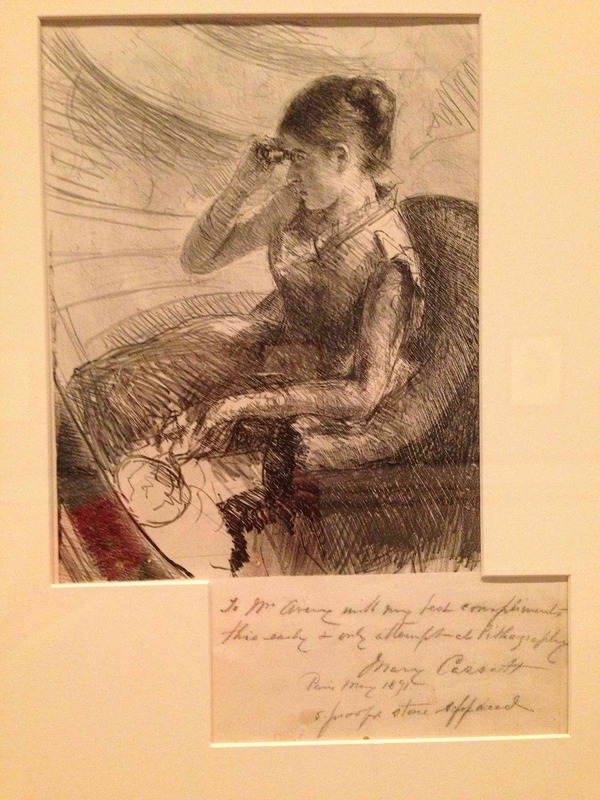 The only lithograph Cassatt ever did, personally inscribed to Mr. Avery. Still using a flip phone? Don’t know how to code? There’s nothing wrong with sticking with what you know, but expanding horizons with new technology is always good. In 1876, it’s exactly why Mr. Degas invited 32-year-old Mary Cassatt into his studio, showed her some of his printmaking techniques, and encouraged her to jump in and try something new. 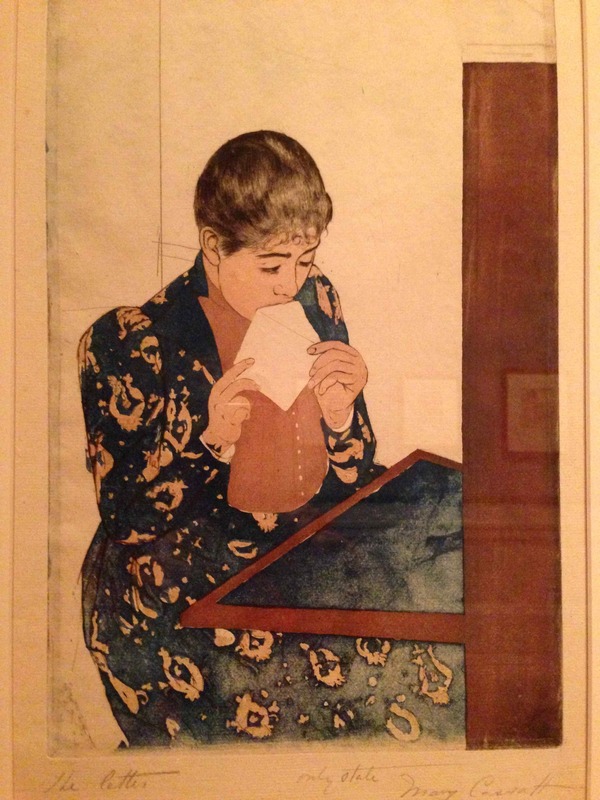 She did, and her technological triumph is the story of NYPL’s illuminating third-floor show, Daring Methods: The Prints of Mary Cassatt, which ends Saturday. The show gives you a new slant, documenting this American artist’s struggle to make new work, push her technical boundaries, and mash up styles to total critical acclaim at the turn of the last century. NYPL found itself in a unique position to mount this show, since art dealer/print collector Samuel Putnam Avery made an unprecedented donation back in 1900 — more than 17,000 19th-century prints, including dozens and dozens he purchased directly from Cassatt as evolved her printmaking between 1878 and 1898. 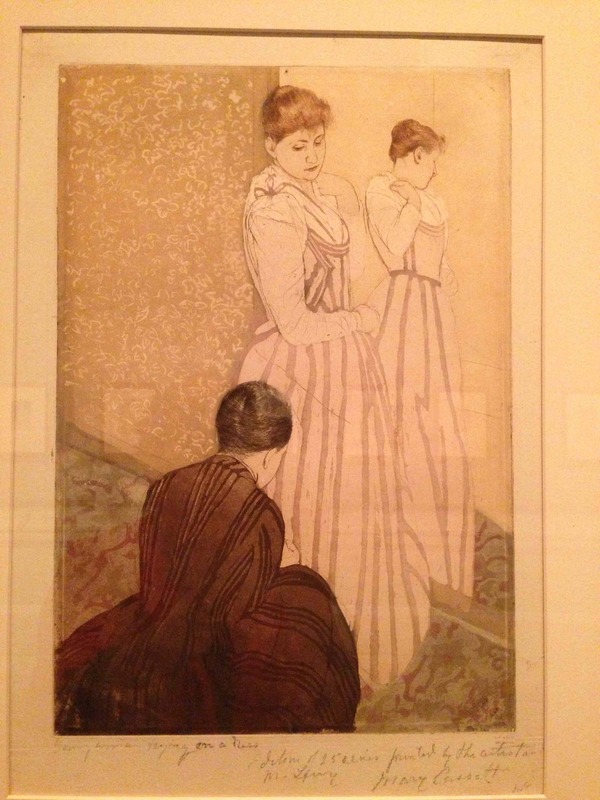 This show provides art-lovers with a unique, chronological walk-through of Cassatt’s technical trial-and-error, beginning with her early drypoints (1878 costume studies suggested by Degas), simple drypoints and etchings, and her only litho (see right). Cassatt continued to experiment throughout the 1880s, perfecting her softground, drypoint, aquatint, and etching techniques, often mashing them together – brave moves by a stylish, curious female artist of the modern era. Gallery visitors walk slowly from print to print, taking in the subtle changes, redirects, and reworks of this modern, mid-career artist determined to find status and success in the male-dominated Parisian art scene of the late 19th century. The NYPL curators decided to hang multiple versions of similar subjects side by side, so you can really examine the mind of the artist at work. It’s interesting that Cassatt let Avery have prints off cancelled plates that she pulled after the “good” print run was finished. You’ll see the scratched-up images in the show next to the best ones. In 1890, everything changed for Cassatt, when she saw an exhibition of Japanese woodblock prints took the Parisian cultural community by storm. It was the moment that her technical experiments paid off and her printmaking vision, style, and legacy became sharply focused. In the last portion of the show, you witness her brilliant response — making intaglio look like woodblock, applying multiple areas of bright color, injecting pattern into domestic surfaces, and zooming in for low-angle close-ups of private moments in women’s lives. Enjoy NYPL’s selections from Mr. Avery’s collection and spend some time examining the multiple states of the most beloved prints in the Impressionist canon, mash-ups of aquatint and drypoint. It’s a master class in color, ink, and composition. If you can’t get to the show this week, download the PDF and take a look at Ms. Cassatt’s technical journey. Then go out and try something new. This entry was posted in Art, Fashion, History, Museums, Technology and tagged art, design, drawing, fashion, history, museums, style by mssusanb. Bookmark the permalink. Would have loved to have seen this! Who knew the NYPL mounted shows like this? It’s really refreshing that you always put the perspective of the past into your posts. E.g., social media has been around for ages — it is just the form that changes. Thanks, Josh! Just went to Adhocracy, which you would love. Will post about it soon, but there’s only one more week. New Museum.